On his recent album New Ocean, Jake Bellows wraps gentle sentiments in sunny songs unearthed from his backyard: it's music both modern in its fusion of genre and nostalgic in its temperament, full of yearning and hope. His new video for single "I Know You" brings out these strengths. Like waves crashing on an isolated shoreline, the song's clickety-clack rhythms persist alongside Bellows as he reaches out, while the guitar is campfire intimate and the warbly flourishes of psychedelic-rock intoxicate. 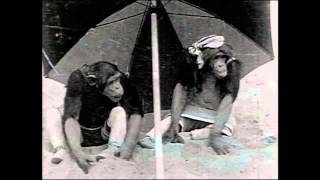 The video, on the other hand, is wholly innocent, documenting the adorable romance of two chimpanzees by cutting together old footage from The Prelinger Archives. Wisely, it plays on the emotional juxtaposition of the chimps' carefree happiness with Bellow's heavier thoughts, making for something that's thought-provoking and contemplative even as it's charming and humorous. Find more on Jake Bellows at his official website.